It’s September 2028 and Sarah’s daughter is getting married. 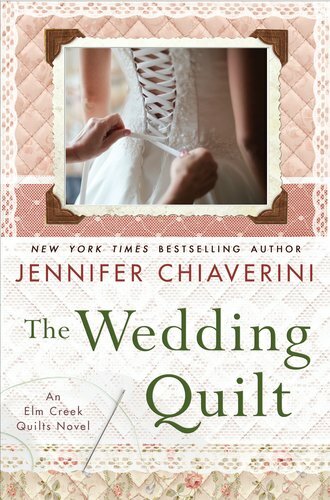 Chiavernini takes us back in time as Sarah’s thoughts are filled with brides of Elm Creek Manor past and present-the traditions they honored, the legacies they bequeathed, and the wedding quilts that contain their stories in every stitch. Sarah is also working on the perfect Wedding Quilt for her daughter complete with loving messages from all the guests of the wedding. As you know by now this is one of my favorite series. I love it when the author takes us back in time for the history of Elm Creek Valley and the when she writes of the wonderful Elm Creek Quilters. The Wedding Quilt has left me very sad and conflicted. I know this is not the last Elm Creek Novel because I have an advance copy of Sonoma Rose right here on my desk, but while it is billed as an Elm Creek Quilts Novel, from a glance it doesn’t look like it features any of our favorites or connects to their history. All of the current ladies’ history was wrapped up in The Wedding Quilt. The author put together snippets from past books and added a few pages to tie up all the loose ends. I feel like I have lost my fictional friends. While Jennifer Chiaverini is an awesome writer and writes wonderful stories featuring very strong women, the was clearly not her best work. I feel there could have been several more books written with these characters. When I received this book I thought The Wedding Quilt would be about Anna and Jeremy’s wedding who came together at the end of A Quilter’s Holiday. I was shocked to find the wedding for one of the twins just born in real time. There is no way to go back. I know sometimes the author’s work doesn’t necessarily go in the direct they would like, publishers and others have a great deal of input. I wish she would have just taken a break from the characters her readers had come to love and let us know she was headed in a different direction either with the series or an entirely new project. I have read several other reviews since finishing of people who also were shocked or disappointed in this installment. When you read a series through 18 books you become attached to the characters and the way it wrapped up just feels wrong.